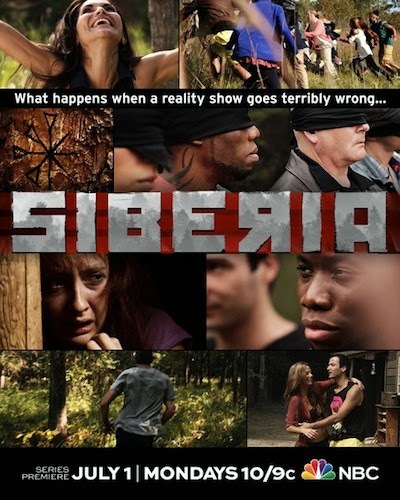 For the last couple of months in my Cancellation Watch column, I’ve been writing off NBC’s sci fi/horror mock-reality series Siberia as certain to be cancelled based on the ratings it has been pulling on Monday nights. The series started out with adequate numbers for a Summer series (it debuted with a 1.1 rating in the 18-49 demographic based on the overnights), but it sunk as low as a 0.6 score (iffy even for a basic cable show) and stayed close to that range throughout the second half of its run. Based on those numbers, it seemed reasonable to assume that NBC would have no interest in picking up this show for a second season, even though it was likely an inexpensive production. But all of my assumptions were based on the standard model used by the networks for producing and airing a series, and I discovered just yesterday that Siberia‘s producers didn’t follow that route. Typically, a show is pitched to a network and if they like the idea they agree to fund a pilot episode and from that they make the determination on whether they will greenlight it to series which usually involves shelling out the money for a thirteen episode initial run. According to an article in Variety, Siberia didn’t follow this path, though. It’s producers–whose background is in feature films–fully funded the series prior to it ever airing. So it skipped the pilot process and arrived at NBC as a completed package. That may explain why it didn’t receive a lot of promotion, perhaps the network didn’t quite know what it was getting or how to market it (sounds like this all came together in very short order). The article did not go into detail about how the producers did this, so I’m not quite certain how the financing worked between them and NBC. Perhaps they split the revenue from the advertising, which would have meant that NBC had no upfront costs and the money for commercial time was all gravy to them. Even if they did that, though, if the network promised a certain ratings guaranty (which was almost assuredly higher than that 0.6 level), they would have to make that up to the sponsors with free add time in another slot. But then those are just assumptions and the fact is that in any scenario Siberia was likely a low cost / low risk show for NBC. And that improves the chances that they may see fit to renew it, even though I previously asserted it was all but cancelled. And if NBC does not pick up the second season, that’s not a death knell for the show either. According to the Variety article, the producers have sold the show to other markets because NBC does not own it and they can sell it to who they choose. So if the peacock network bows out of a second season, there are plenty of other outlets that might be interested. And this in an inexpensive series from what I understand, so one of the cable networks could easily take a flyer on it. And it won’t necessarily take a fan “Save My Show” campaign to make that happen (though having the fans show there support definitely wouldn’t hurt). And the fact is, this one would fit perfectly with Syfy’s current line-up. They have a hefty dose of reality shows on their schedule already, so that audience would seem primed to carry over to this mock-reality series. This is actually good news for those of us who found themselves addicted to this show (and who can’t imagine being left with no resolution to that big cliffhanger). It may take a while for a second season announcement to surface, but now I am saying this show is more likely than not to get renewed. It’s hard to say for sure since this is a completely new model, but at least the producers of the show are in control of its destiny at this point. 16 reality-show participants descend on Tunguska, oblivious to the land’s mysterious past, to battle for a cash prize in this thrilling mockumentary. Strange events begin to occur, and the contestants soon attribute these occurrences to ruses set up by the producers, even dismissing the death of a fellow contestant as accidental. However, the contestants soon come to the chilling realization that the strange occurrences are not part of the show. I need Siberia!!!! I will go crazy without it!! #Seriously Everyone needs Siberia! The last words cant be “Your not supposed 2 b here”! and then no second season! Then one of them had damn well better buy it!